I am doing a 40 day challenge to get rid of 40 things, 1 item a day for 40 days...Doesn't sound hard at all does it? It's harder than I thought it would be though so maybe writing down things that do go will help encourage me a bit more. We'll see. 1 - Box of stuff from sunroom. 2 - Another box of stuff from sunroom. 3 - 2 shirts in bin. 4 - 8 shirts, 1 skirt, pair of shorts to Vinnies. 5 - A manual muili/grater type thing to Vinnies. 6 - A mug that I broke the handle off of. I had it sitting on the bench for a week before I decided that I should take it out and put it in the bin!! 7 - 2 plastic cooldrink bottles that I was reusing for water. 8 - Big glass bowl. 9 - 3 old phones. 11 - Stick on corner shelf unit. This has been put out in shed so does it still count? hmmm. What will I do? Where will I go? March. 😄I have heaps to do this month, a main one will be trying to get my neck/back sorted. It's been painful for going on 4 weeks now and I have finally decided to go see a doctor about getting a scan to see what it is. The appointment with them is this morning. While I am there, if I remember, I will ask to get bloods done as well as it's been a few years since they were taken. When I think about it, I haven't been to a doctor for years, not sure how many but quite a few. I think. Anyway, I am popping Iboprovin like they are lollies and I don't like having to do that so doctor for some other ideas it is. I usually only need to take a couple of pills on a bad day with the fibro so for a person against pills it's not been good. Get a massage, see if it helps my back. Done. Didn't. See doctor to confirm muscular. Done. Is. I need to clean out the chook sheds before Winter. Oil chooks legs again, for Scaley Leg Mite. Make appointment for new glasses. Clear out big tank garden. Weed mulched area under Orange trees. Decide on 2 places to go to and then go. Well, look at that. I started writing this on the 3rd, so 2 weeks ago. Hmmm. I know I have been busy over those 2 weeks but not with much on that list! I am at work for probably 4 days this week so not much will be happening here but I have mowed twice in the last 2 weeks. Edges need doing and I can't do those so it still looks, and is, very messy and overgrown out there. Did help husband a little bit to get the wood into the woodshed from out the back paddock. Maybe shouldn't have as feeling neck and back now...Hohum. I think I need less time on this thing and more time outside doing stuff. Should I add that to my list?! I am not Catholic but apparently the 6th March was the first day of Lent. Catholics know what Catholics do over this time but there are lots of non-Catholics that decide to give up stuff as a bit of a challenge during this time and I have become one of them. Last Wednesday I was invited to join a small Facebook group where the aim is to de-clutter 40 things over the 40 days of Lent. I joined up and hope that with other people doing the same thing it will get me started on getting rid of things I no longer use, need or like. You'd think though that if I didn't use, need or like them then they wouldn't be here anyway wouldn't you but some peoples brain don't work like that and we need a bit more encouraging and support. This small group may be what I need to get me started. We will be aiming to declutter 40 things over the 40 days of Lent, post in the group to encourage and help others and to read and get the help and encouragement of those in return. I will also use this blog to record how I go as I know I always do better with things when I write about them here. Today is the 6th day of this challenge. The first 2 days I did good by getting rid of 2 boxes of unwanted stuff that had been sitting out in the sunroom for months. Since those 2 boxes of stuff I have removed nothing. I am at Vinnies this morning so I have a bag ready and I now need to go find 6 things to take down there. I already have 2 things in the bag so I only need 4 more so not sure why it is so hard. But, on Saturday we went to a fete and I bought some books so I probably *should* get rid of a few books to make room for them. But books...I'll work on them another time. Off to grab some crap...Done! In the bag and ready to go. What have I done? Where have I been? March 6th. I am still down at Vinnies 3 days a week plus extra days as we are short of volunteers for a few months. Husband and I went up to Boddington for a weekend in February. Not camping but it was nice to get away for a bit. Over the last few months we have been picking bananas, grapes, a few apples, now peaches are falling off the tree and there will be more apples if I remember to get some bags over some branches so the parrots don't get the rest. Chooks are back to laying. Not much in the vegies gardens though. I did have a few lovely looking capsicum plants and we picked a few but the sheep got out and into them so HoHum...Husband did get some lovely onions from his patch and a bit of garlic that will be nice to eat but a bit small for replanting. All the grass stayed green over Summer but we didn't mow often enough, as we do. Or don't. It needs doing again now but we are forecast 2 days with rain so that wont be happening. I am still fat and unfit. I didn't declutter enough. I didn't clean enough. I didn't achieve much of anything. Hopefully this month will be a bit better and more productive. Hmmm, we'll see. 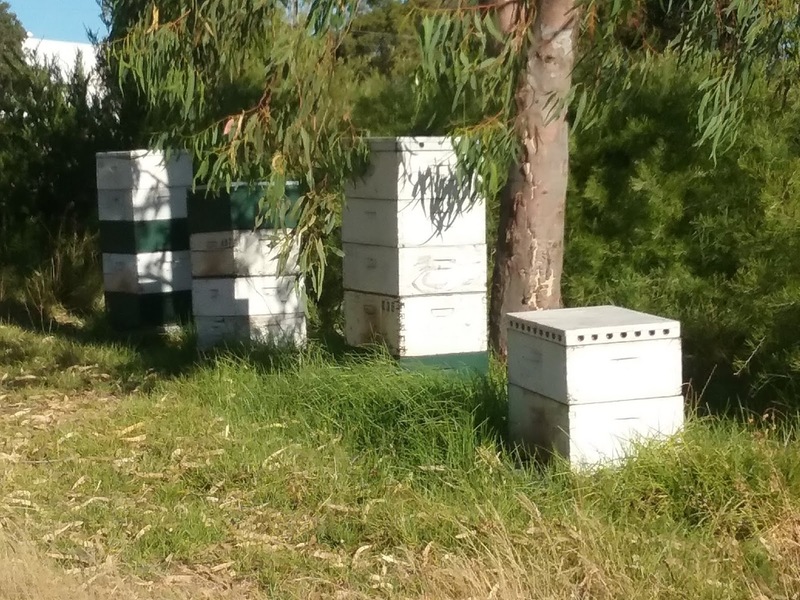 Our last honey extraction was way back in March then we left them alone for the Winter but once the weather warmed up and the bees got busy we could have done an extraction during Spring and should have done one during December. 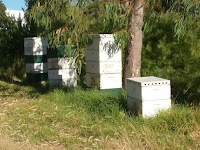 Husband has put extra supers on the hives so the bees have plenty of room and haven't swarmed but the boxes are full and really do need doing. It is something that we must do this month sometime. Definitely must do before the Redgum is ready. Back in Spring daughter and I cleaned the extraction shed out, we karchered it all, painted the floor, washed everything so it was all clean and ready to go...But it never happened. My plan next week is to vacuum the extracting shed again, dust everything again, cover everything to keep the dust off and have it all ready for the day he says " We're extracting today, ready for it?" And I will smile and sweetly say "Of course Babe" It will take him maybe 5 minutes to put his hat and veil on, light the smoker and be ready. He will be out in the paddock with the trolley ready to start before I have even started. It will take me longer to finish what I was doing, find my suit and put it on, put my boots on, and my gloves, find my nerve and get out there to "help"
I can't do much out in the Apiary though. I can use the smoker...that's about it really. I am not strong enough to lift the boxes even though they are not full size supers only WSP's. I cringe and sook if too many bees get too close to me, and they do, there are a lot of bees in 4 hives and they don't always like having the roof of their house removed and rooms taken away. So really husband does it all out there and I am there just to put in an appearance because they are "my" hives and it is "my hobby". Once we have the boxes of capped honey frames on the trolley and he pulls them across the paddock to the extracting shed then I can do a bit more. If I had to I could do it all once he gets the boxes into the shed but it would take me all day and there would be a big mess and I would probably be crying. Before that though the whole apiary area needs another mowing as the grass is too long and snakes could be hiding...And this is one other thing that I am too sooky to do. Husband will get out there on the ride-on, in shorts and thin shirt, maybe his bee hat, and job done in half 20 minutes. It will take me longer than that just to suit up. So yeah, another job on his list. He did make a start a few weeks back but it's all grown back again and like all the grass around here really needs doing more often just to keep it reasonable. 40 degrees some are saying and 40 is hot, and same tomorrow they reckon. Yeah, it's warm and today I did go swimming in the dam a couple of times so maybe it was hot. 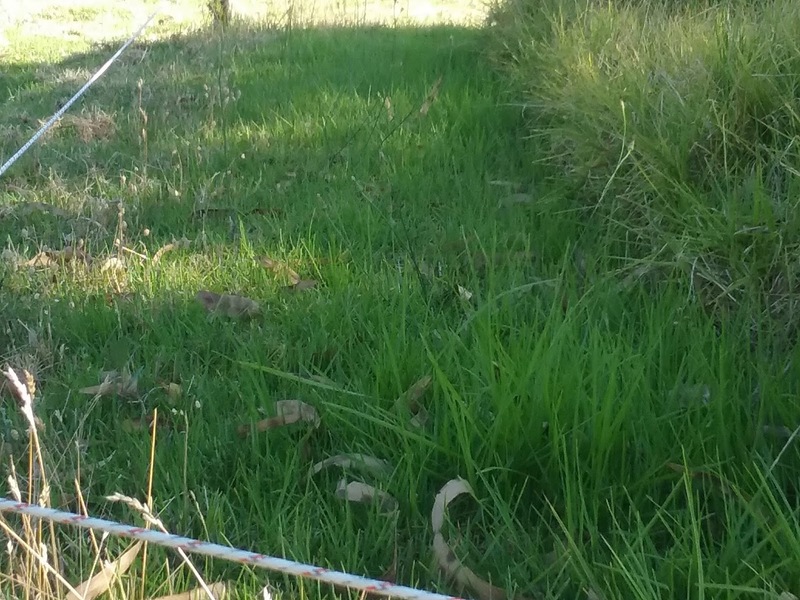 We are a couple of k's out of town on 5 acres, with paddocks around instead of houses. 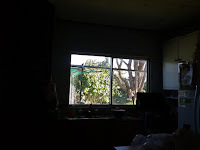 We have grass that stays green without watering even during Summer and lots of trees so there is a lot of shade around and husband has put misters up in what we call our Shade Area and they work great to cool the air, it is noticeably cooler within minutes of turning them on. The birds really like it when we turn them on too and dozens of little birds come in and flitter around, it's really pretty good to see. Inside we only have wall fans and we have those on when it's warm inside. Close the front curtains during the day and open them at night to let the breeze in. If it's too hot inside then we go out and sit in the shade area. 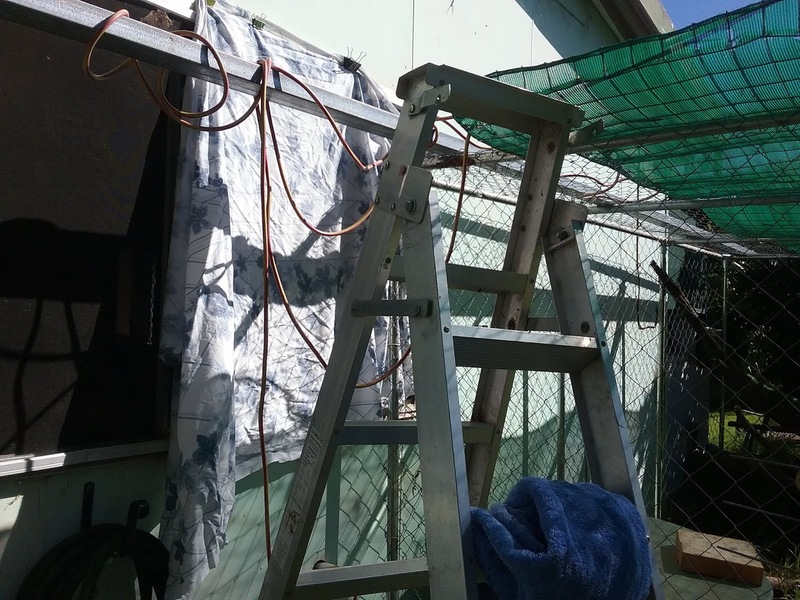 The chooks notice the heat so if we are home we put sprinklers on for them but even without that there are plenty of trees for shade in their yard and they have continuous waterers so they always have fresh water. I don't like the heat though, I much prefer Winter, but with a bit of common sense, some forward planning by husband and the lovely area that we live in...we will survive, even with a few hot days. I will take a few photos tomorrow to show why it is so cool here when lots are dealing with the heat. 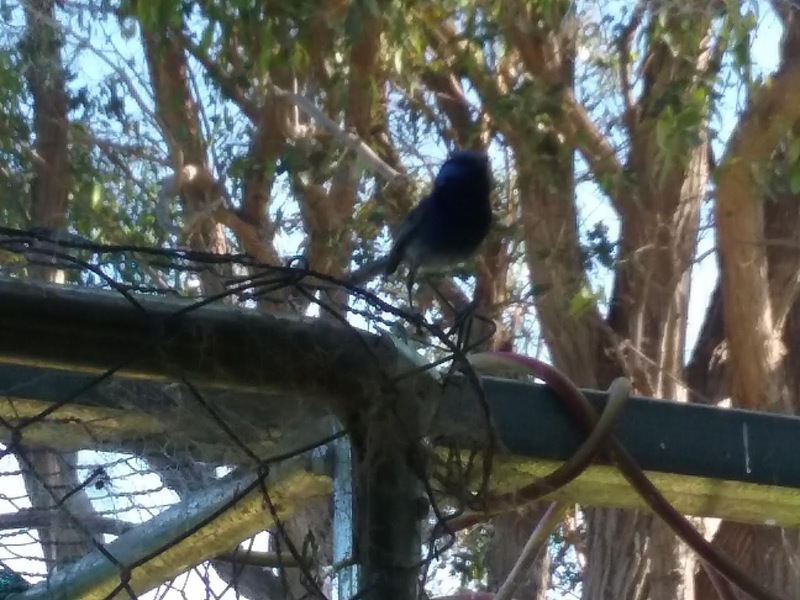 Curtains Up For Little Blue Wren. The curtain I put up with so much effort yesterday blew down with last nights wind so little bird was back this morning. 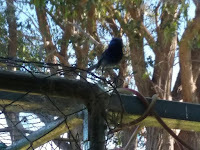 The wind blew and a gap formed and little blue wren came back. I was concerned that he would get stuck between the board and the window so had to go hunting for another solution. That was one of my boxes, not the best but will work for now and maybe husband will get home today. In 10 minutes he will have it sorted, no problem. 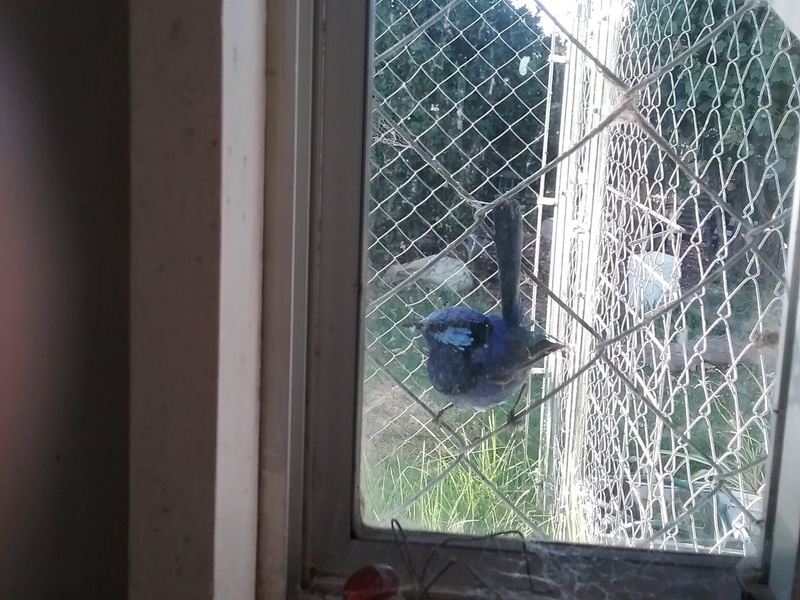 I was away from home most of yesterday and didn't get back until around 3:30/4:00 Did drop in for a bit to pick something up with T and she noticed a bird at the kitchen window, sitting outside and sometimes tapping the glass. We thought it was cool and that it was probably getting bugs from all the spider webs. 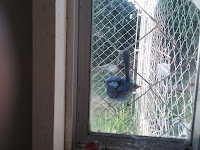 Went out again and when I return home the bird is still there, still tapping the glass with it's beak. It didn't seem too fussed about me getting close to the window and taking photos either. After a bit I posted on a bird group and someone mentioned Blue Wrens being territorial and reflections...Of course! So I went outside and yep, reflections. He was thinking that there was another bird in his area. Three hours later and it was still there! 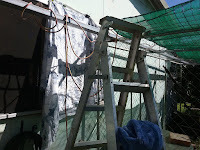 The wire cage that you can see the corner of, that is our cat cage. 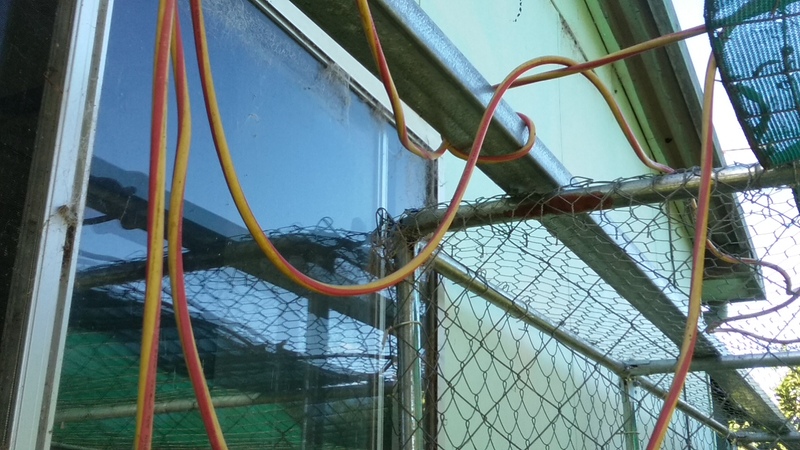 The wren was flying in and out of that and sitting on the wire, not smart for a bird to enter a cat cage. This morning he was back, tapping at the window with his beak. I knew I had to stop his reflection but wasn't sure how to. I hung a towel from the inside but that didn't work. What I needed was something on the outside but that was going to be a bit trickier. I tried throwing a towel over that rail that the cords are on but there was still too much glass so he still came back. 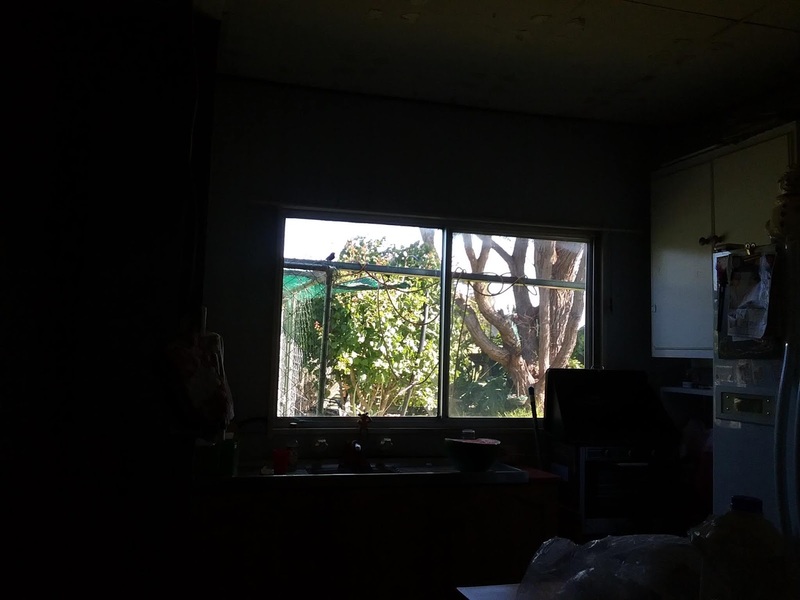 In the end I knew I had to cover the whole pane of glass, but how? I ended up hanging an old curtain up but I don't know how secure it is. Not very I think but it is doing it's job. My first attempt I didn't cover the whole window, missed a spot and he found it. Oh and a heads up. If you are not as fit and agile as you once were...Put a block of some sort under the ladder leg so it doesn't wobble as much. Tie your shoe laces up before climbing the ladder. Don't rely on bendy shade cloth wire to support you. I will ask husband to make it more secure when he gets home from work. It's Friday the 4th January so we are 4 days into the new year. I woke up feeling good but then started feeling blah and teary for no reason and wondered why. Had some Magnesium as that usually helps but then I remembered today as something different. Thirty years ago today I was in a hospital so I missed daughter L's 1st birthday. Happy Birthday L. Sorry 'bout that. I was put in hospital a week or 2 beforehand for what the doctors called "Chronic Clinical Depression" I only remember bits of the years leading up to it, husband says it's better that I don't remember things. He says things weren't good. I know it wasn't a good time for the kids...But I got better so today surprised me. Depression is a bad thing, it mucks with your head and you become someone different. Sometimes someone not nice. There seems to be a lot of it around and sometimes I wonder why. What makes some people so sick that life becomes a chore and they want out? What makes us feel so bad that each day is an effort? I know a few people that suffer from Depression and have been on medication and seeing counsellors for more than 20 years and I hear others talk of the same. Twenty years! I can not get my head around that. Twenty years and still not "better" Why would someone continue taking pills and doing the same thing for 20 years when it hasn't worked, when they still need medication and counselling? I truly don't get it. A lot of these people drink and smoke and eat crap to relieve the stress and pain of their Depression, does this work for them? Maybe. Maybe they would be worse off if they didn't. Maybe. I was talking to someone about this recently and they told me that I didn't understand. That I would never know what they had been through and so shouldn't try to give advice. I had told her she should stop filling her body with poisons and she might have a chance at getting better and she didn't like that. Said it wasn't that easy. But what if it was that easy? Give it a go and tell me in 3 months that you don't feel better. Don't tell me that I don't understand. Been there, done that. And don't blame your childhood for how you are today. Some people have really crappy childhoods, some get hurt so bad..., some people have major losses to deal with... Of course it's going to mess with our head. Don't let it ruin your life though. I believe that Depression can be fixed, that people can recover from it, that they can get better. If you suffer from this please don't take offence at anything I have written. I'm not saying it's your fault, I'm saying that if what you have been doing for the last 20 or how many years is not working then just try something different. It may be that simple. First day of 2019 and I was up early, around 4:40 am. I love getting up early but prefer 5 - 5:30. Before 6am anyway. Half past 4 is a tad too early but anything after 6 and the morning slips away too quickly. So I have a coffee, go on Facebook, read some blogs. Then outside for a look around, check the chooks, turn off any sprinklers that have been on overnight. Then I get busy doing nothing and before I know it husband is up and it's time for another coffee, a bit of a chat and soon it's too hot for me to be outside. This morning though Husband says he'll help me get the extracting shed sorted. I have been asking for help for weeks now so had to go along with it even though it was getting too hot for me. Months ago daughter T helped me empty this shed, then we power washed it all and I then spent 4 days getting the floor painted. Another few days to put the shelves back in then some more time to get the table and the tubs of jars back in there. But the honey extractors were something that I couldn't get back in. I couldn't move them by myself and T has been unwell so didn't want to ask her. But now it is all put back together so we are ready for the long overdue extraction, whenever that may be. The rest of the day I basically did nothing. Except I had a sleep for a bit in the afternoon. 'Cause 4:30 is too early you know. It was hot so we spent a few hours outside, me sitting in the shade and watching the birds and husband cleaning a barbecue we acquired yesterday. Son came out with his dogs for a bit and when he left I came in to make tea then decided to go into Vinnies and collect some rubbish as tomorrow is our bin day and there is so much down there. Then back on here until bedtime. Which will be soon. Not a very productive day but a pretty good way to spend the first day of 2019. How did you spend the 1/1/2019? Hi I live in the Peel Region of WA. We grew all our vegetables during 2010 and will do the same this year but I also want to get fit enough to wander the countryside, climb big rocks and swim in lakes and rivers. Some Blogs That I Read. Did you miss me? *I* sure did! Spring - a time of new life but it seems to be death around here.